The Ski Trab Sintesi helmet is strong and light, good for racing or general ski touring. It features clips for attaching a headlamp and good ventilation for those long uphills. The optional visor adds full ultraviolet light and wind protection, and can be raised and lowered easily based on conditions. In-mold construction features a polycarbonate external shell with a high-density polystyrene interior. CN EN 1077 certified for skiing so you can open it up on the downhill with confidence. Optional polycarbonate visor had an anti-scratch coating on the outside and anti-fog coating on the inside (34 grams). Comes in two sizes and weighs just 270 grams (8.5 ounces) in the medium size. Hi, can I buy glasses/ goggles for this sintesi helmet ? Hi Pawel, we don't have any visors for this discontinued helmet, but we do have the Attivo lens. Unfortunately I can't verify whether they are compatible. Howdy - I was up at the Thanksgiving brighton skimo race; didn't know that you were in town. 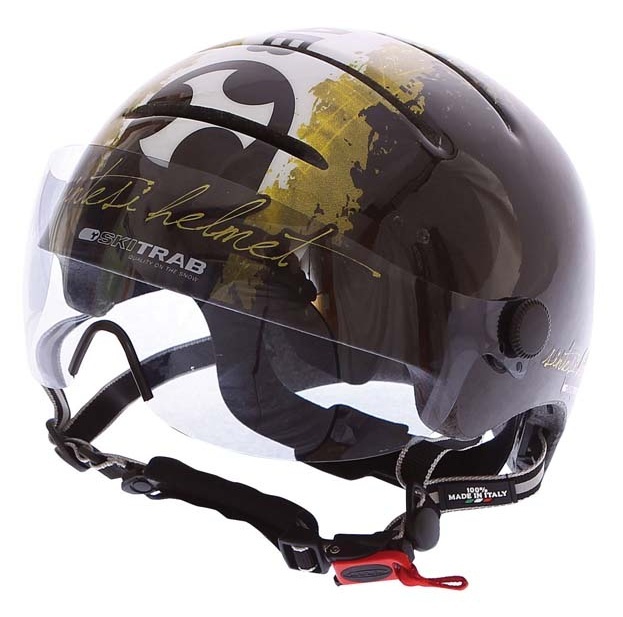 quick question - I was thinking of that ski trab helmet, but it looks like you are out? do you have the visors if I could find a helmet w/o one? Hi Tom, I think I saw you there. Ski Trab was unable to fulfill North American orders for the Sintesi this year, but they did ship the visor oddly. So yes, we currently have visors and no helmet, and would be happy to get you one.